One is a pro-European Liberal who has never been elected and only founded his party a year ago. The other is a far-right establishment challenger who wants to take on globalisation and the EU. Between them they have taken on and defeated the two political parties that had ruled French Politics for years. 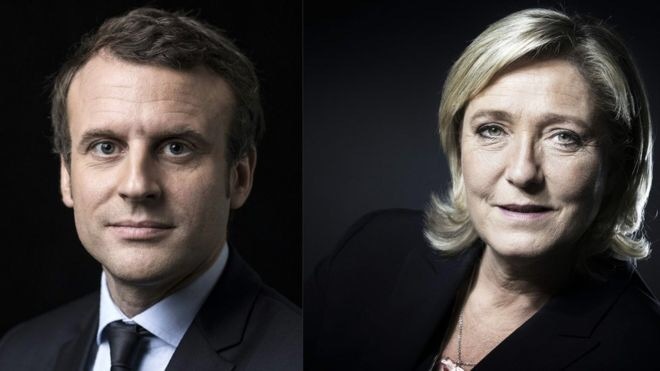 Today one of them will be voted French President. But that is not all that France is choosing. They battle to run a country beset by unemployment over 10%, with one in four under 25s unemployed. More than 230 people have died from terrorist attacks since January 2015 and the country lives under a state of emergency. Those are the problems, and France is choosing which direction they want to go in order to solve them. Not left and right. No, the Socialists and Republicans don’t have a horse in this race. No, the choice today is between International or National. Emmanuel Macron formed the En Marche! Party in April 2016. He speaks on platforms with the EU flag behind him and talks of deeper EU integration in the form of a Eurozone budget and Eurozone finance ministers. He says he will cut 120,000 public sector jobs, reduce public spending by €60m, put billions into investment and cut unemployment to below 7%. Marine Le Pen, who until two weeks ago was the leader of the Front Nationale, wants to give herself six months to negotiate a return of sovereignty for the EU and then put first the euro and then the EU to the French electorate in a referendum. She wants to cut the French retirement age to 60, allocate public services to French citizens instead of foreigners and ‘renationalise’ French debts from the ‘foreigners’ she says hold them. She wants to suspend the EU’s open border agreement on France’s borders and expel any foreigners on watch lists of intelligence services. Once the French people make their choice of President, that person may have trouble getting policies through the French Parliament. At the moment Macron’s party has no MPs and the Front Nationale has two. Unless this changes in the French Parliamentary elections in June the new President will have to ‘co-habit’ with their Parliament. This means ruling with the help of other parties’ MPs. Possible, but difficult. Macron is predicted to win with relative ease today. But as we know nothing is certain in politics these days. If Le Pen wins, chaos will ensue around Europe. Could it happen?